The terrorist attacks in America on September 11th, 2001 changed the world forever. As the tragic events unfolded, people around the globe watched in horror as thousands of innocent lives were lost right before our eyes. The aviation industry would never be the same. Flight crew were locked behind a bullet proof door, meaning no flight deck visits for budding young pilots. Strict new security measures were enforced, both on the ground and in the air. Iconic airlines – crippled by the downturn in the industry became consigned to the history books and those that did survive became shadows of their former selves. Many cabin crew and pilots decided to hang up their wings and for those who remained, the threat of terrorism was, and still is, a constant concern. Here we remember the cabin crew members who faced unbelievable adversity that day, yet remained strong for their passengers and colleagues, onboard American Airlines (AA) Flights 11 and 77, and United Airlines (UA) flights 175 and 93. Operated by a Boeing 767-223ER (N334AA), the aircraft was on a scheduled transcontinental services from Boston Logan International (BOS) to Los Angeles International Airport (LAX). The crew consisted of two pilots – Captain John Ogonowski and First Officer Thomas McGuiness. In the cabin 76 passengers were looked after by nine flight attendants. Purser Karen Martin, who along with Barbara Arestegui, worked the first and business class cabins, where the five hijackers led by Mohammad Atta, were sat. The pair was assisted by Jeffrey Collman, Sara Low, Kathleen Nicosia, Jean Roger, Dianne Snyder, plus Betty Ong and Amy Sweeney – who provided invaluable information to the ground during calls they made after the hijacking. Scheduled to depart at 07:45, the aircraft took off at 07:59 and climbed out over Massachusetts. Approximately 14 minutes later at 08:13, the hijackers made their move. Martin and Arestegui are likely to have been attacked first, as the men made their way towards the front. Mace was sprayed into the forward cabin, as the ‘muscle’ hijackers over powered the pilots and barricaded themselves inside the cockpit. In the cabin, the remaining crew evacuated everyone from first and business class. To keep them calm, passengers were informed that there had been a medical emergency. Repeated attempts were made to contact the flight deck, but there was no response. Betty Ong and Amy Sweeney used the air-phones to call the ground and inform them of the unfolding situation, whilst the other crew members organised themselves into teams, relaying information and tending to the terrified passengers. Ong called American Airlines reservation centre at Boston, but was plagued by a poor connection and due to the speed of the attack there was confusion as to what exactly had happened, “I think we’re being hijacked”. Meanwhile, Sweeney contacted the airlines Flight Operations Centre and spoke to manager and friend Michael Woods. She told him that two flight attendants, the pilots and a first class passenger had been stabbed. What is clear from the calls is that although the terrorists had control of the aircraft, the flight attendants were in control of the cabin. While Ong and Sweeney passed details to the ground, their colleagues continued to bring information, including where the terrorists were sat, allowing investigators to quickly determine their identities. Both women remained calm and professional throughout, continuing to talk as the 767 rapidly descended towards New York. They reported that the aircraft was being flown very erratically and that they were being thrown around violently. It was now becoming clear that something was seriously wrong and for the first time, fear was heard in Sweeney’s voice. “I see water. I see buildings. I see buildings! We are flying low. We are flying very, very low. We are flying way too low. Oh my God we are flying way too low. Oh my God!”. These were Amy Sweeney’s final words. At 08:46:30 American Airlines Flight 11 crashed into the northern facade of the North Tower of The World Trade Centre (WTC), instantly killing all on board and hundreds in the building. The aircraft, travelling at 465mph and carrying approximately 10,000 gallons of fuel, hit between the 93rd and 99th floors and severed all escape routes for those in or above the impact zone. As the tower burnt, TV stations everywhere interrupted their programmes with live footage of the unfolding drama. As the eyes of the world focused on New York, no one could imagine what was to come next. Also departing BOS that day, bound for LAX, was United Airlines Flight 175. The aircraft, also a Boeing 767-222 (N612UA), was carrying 51 passengers and nine crew members, including Captain Victor Saracini, First Officer Michael Horrocks; and flight attendants Robert Fangman, Amy Jarret, Amy King, Kathryn Laborie, Alfred Marchand, Michael Tarrou and Alice Titus. Five hijackers, led by trained pilot Marwan al-Shehhi, boarded and took their seats in the forward first and business class cabins. The aircraft took off at 08:14, just 15 minutes after American 11. By 08:33 they had reached their cruising altitude of 31,000 feet and the cabin crew are likely to have commenced with the drinks service. A few moments later, as the drama on Flight 11 was unfolding, ATC radioed United 175, asking if they could see the AA jet. They confirmed they had a visual at around 29,000 feet and also reported a suspicious transmission they had heard a few minutes earlier, “Sounds like someone keyed the mic and said everyone stay in your seats”. This was the last contact with United 175. It is believed the hijacking occurred between 08:42 and 08:46. Similarly to American 11, the two pilots were either killed instantly, or removed from effective control of the aircraft and one of the cabin crew members stabbed. Mace was sprayed into the forward cabin and the remaining passengers moved to economy. Crew member, Robert Fangman called the United Airlines offices in San Francisco. Speaking to Marc Policastro, he reported the attack and that the hijackers were likely to be flying the plane. He went on to inform them of the injuries to the other crew members and that the plane was flying erratically. But after just 1 minute 15 seconds they were disconnected. The 767 was now headed towards New York and making a rapid descent, intolerable for the passengers sat at the rear. During the descent the aircraft almost collided with a Delta Airlines jet, missing by just 300 feet and moments before the crash it had another near miss with a Midwest Express flight from Milwaukee to New York. As the world watched the burning tower, it was hard to imagine how – on such a clear, sunny day – an aircraft had managed to impact the huge World Trade Centre. Then the unthinkable happened. Rapidly descending from the beautiful blue sky over the Statue Of Liberty was another plane. At 09:03:02 United 175 slammed into the South Tower. All on board were killed instantly and hundreds more in the tower, as the aircraft cut a swathe through floors 77 to 85. 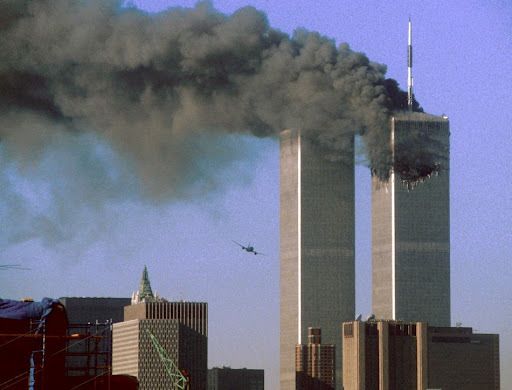 In the final moments before impact the hijackers had put the plane into a sharp left turn, as it appeared they may have missed or simply clipped the building. Those seated on the left side of the aircraft, would have had a clear view of the approaching WTC towers, one engulfed in flames. As the world watched in horror, United 175 approaches the WTC. It was now evident this was no accident. America was under attack. Fear gripped the world as everyone wondered what was coming next. 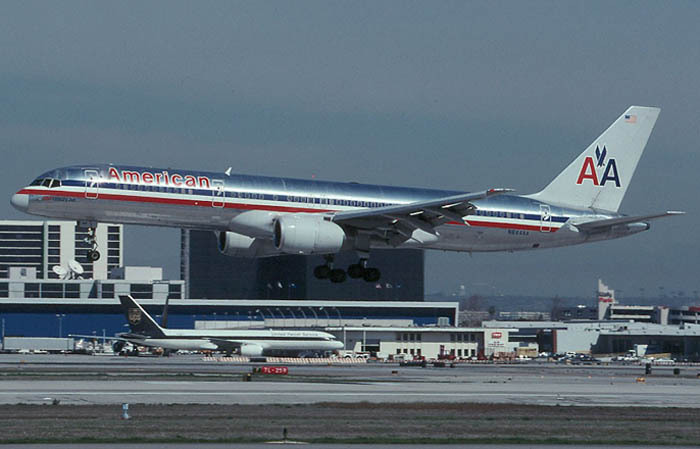 Flight 77 was AA’s daily scheduled service between Washington Dulles International Airport (IAD) and LAX, operated by a Boeing 757-223 (N644AA). In the flight deck was Captain Charles Burlingame and First Officer David Charlebois. In the cabin were four Cabin Crew, Michele Heidenberger, Jennifer Lewis, Kenneth Lewis and Renee May. On board were 26 men, 22 women and five children, ages three to eleven. Joining them were five hijackers, led by Hani Hanjour, who would pilot the 757. As with the flights 11 and 175, the aircraft had reached its cruising altitude and the inflight service is likely to have begun when the hijackers made their move. It is estimated this occurred between 08:51 and 08:54, shortly after American 11 had struck the WTC and United 175 had been hijacked. Crew member Renee May made a phone call to her mother, stating that her flight had been hijacked by six individuals and that they had been moved to the rear of the plane. She asked her mother to contact the airline, which she did immediately. 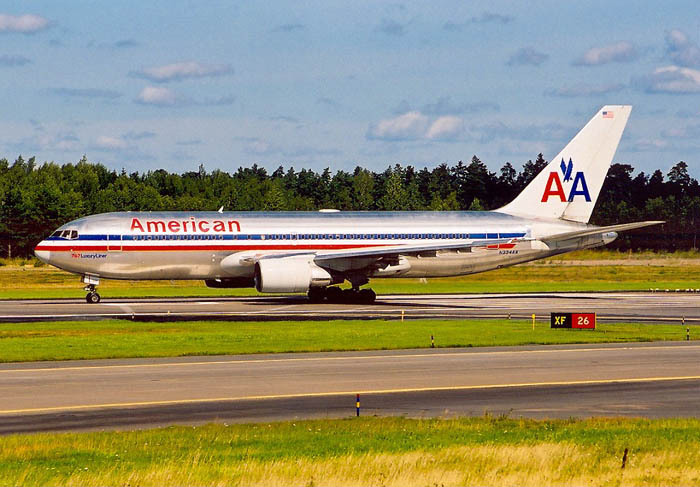 By now American Airlines was aware of the hijacking and Executive Vice President, Gerard Arpey had ordered a nationwide grounding of all AA aircraft. Several attempts were made to contact the Jet, but there was no response. Now just minutes away from their intended target, Hanjour increased the throttles and pointed the nose of the aircraft down. Travelling at 530mph, Flight 77 slammed into the western side of The Pentagon at first floor level. All on board were killed instantly, plus a further 125 inside the building. 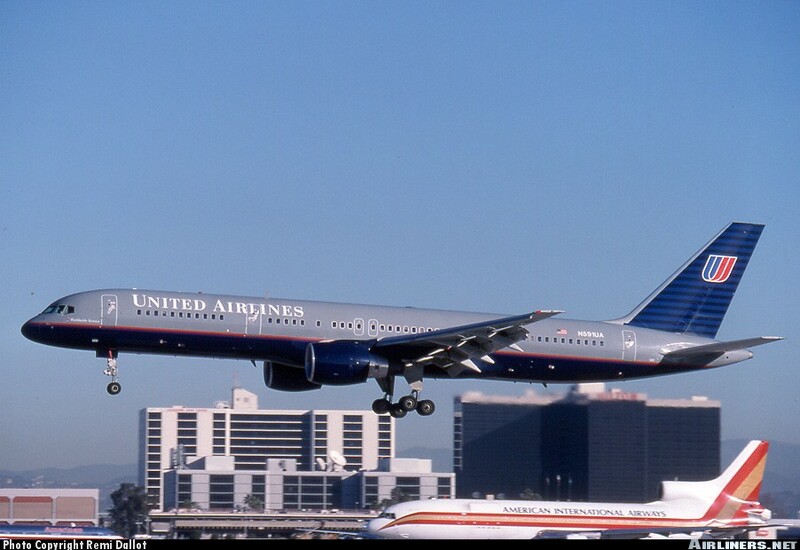 United 93 originated at New Yorks Newark Airport (EWR) and was bound for San Francisco International (SFO). The Boeing 757-222 (N591UA) was under the command of Captain Jason Dahl and joined in the cockpit by First Officer LeRoy Homer, Jr. The cabin crew that day were Lorraine Bay, Sandra Bradshaw, Wanda Green, CeeCee Lyles and Deborah Welsh. The flight was only 20% full with just 37 passengers, plus four hijackers led by Ziad Jarrah. Taking off at 08:42 the aircraft was running over 40 minutes late due to heavy airport congestion. It would be just four minutes before American 11 would crash, Flight 175 had already been hijacked and American 77 would be commandeered nine minutes later. With the attacks unfolding, ATC officials began issuing warnings via Aircraft Communication Addressing and Reporting System (ACARS). 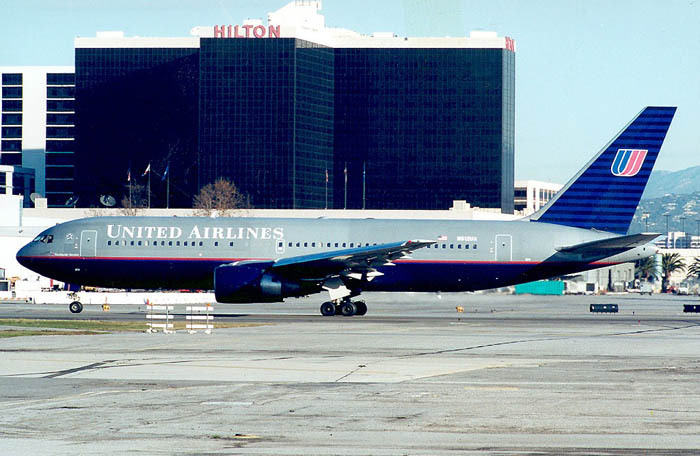 The 757 had been at its cruising altitude of 35,000 feet for around 20 minutes when they received the ACARS message “Beware any cockpit intrusion – two a/c hit World Trade Centre”. Responding to the message Dahl replied “Ed, confirm last mssg plz – Jason”. A routine radio transmission was made and then, silence. The hijacking began at 09:28, approximately 45 minutes after take-off. This differed greatly from the other flights, whose attacks began soon after the seat-belt signs had been switched off. As the three ‘muscle’ terrorists stormed the flight deck Captain Dahl began screaming “Mayday! Mayday! Mayday!” amidst sounds of a struggle. 35 seconds later another transmission was made with an unidentified voice shouting “Mayday! Get out of here! Get out of here!”. From the cockpit voice recorder, Jarrah can be heard announcing “Ladies and Gentlemen, here the captain. Please sit down and keep remaining seating. We have a bomb onboard. So sit”. During the remainder of the recording, moaning and the sound of the hijackers rebuking someone can be heard, it is believed to be Captain Dahl. A woman, assumed to be first class flight attendant Debbie Welsh is heard struggling with the hijackers before presumably being killed. Passengers are again forced to the rear, the hijackers spraying mace and threatening them with a bomb. As with the other flights, phone calls are made from the planes air-phones, a total of 37. An unknown Stewardess attempted to contact the United maintenance facility, but the call was not received. Another FA, Sandra Bradshaw, was more successful and reported they had been hijacked by men with knives and the pilots and another flight attendant had been stabbed. Bradshaw would later call her husband and tell him that they were preparing scalding water to throw at the hijackers. CeeCee Lyles also called her husband, leaving a message that the plane had been hijacked. By now Flights 11, 175 and 77 had already struck their intended targets. 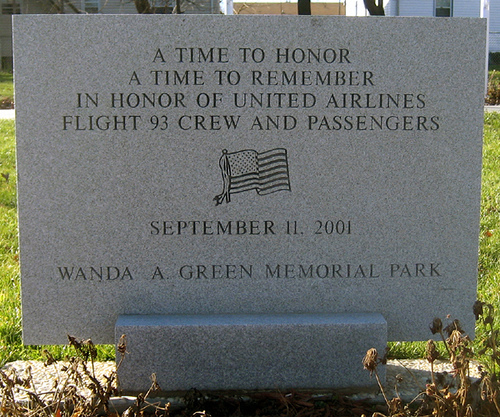 As crew and passengers of United 93 called loved ones and officials, they were told of the attacks in New York and Washington. It soon became clear that their aircraft would not be returning to the airport. Those on board took a vote as to whether to attempt to re-take the plane. Passengers making calls to the ground, informed them of their plan and at 09:55 Todd Beamer’s now famous – “Let’s Roll!” was heard. The fight back had begun. In the flight deck the hijackers held firm and Jarrah began to pitch and roll the aircraft to throw them off-balance. The CVR picked up the sounds of the attack and the panic from the hijackers, as they realised that the passengers and crew were moments away from breaking through the door. As the counterattack continued, Jarrah pushed the nose down and rolled the 757 hard to the right until they became inverted. At 10:03:11 the plane plummeted into an empty field in Stonycreek, Pennsylvania. Travelling at 563mph, the impact left a crater 8-10 feet deep and 30-50 feet wide. All 44 people on board died. The crash of United 93 marked the end of attacks on September 11th. In an unprecedented move all U.S. airspace was closed and aircraft still flying were ordered to land. A total of 2,996 people died on September 11th 2001, 33 were flight crew onboard the four hijacked planes; eight pilots and 25 Cabin Crew. Some gave invaluable details of the unfolding hijackings to those on the ground, while others relayed information to the crew members on the phone. Each and every one of them carried out their role as Cabin Crew with outstanding bravery, following their training on how to deal with hijackers, whilst calming and reassuring the panic striken passengers. In the gallery below we remember the 25 Cabin Crew whose lives were cut so tragically short. Their actions that sunny September morning, began the fight back on the war against terrorism. They are heroes – every one, our Angels Of The Sky.